Hi again, fellow travelers. It's me. You know who. You saw me doing bouncing walks down your aisle, heard me singing, maybe saw the tears welling in my own eyes despite the soothing soft voice I was using. I tried so hard to make my baby happy but, as you probably heard, he was not. 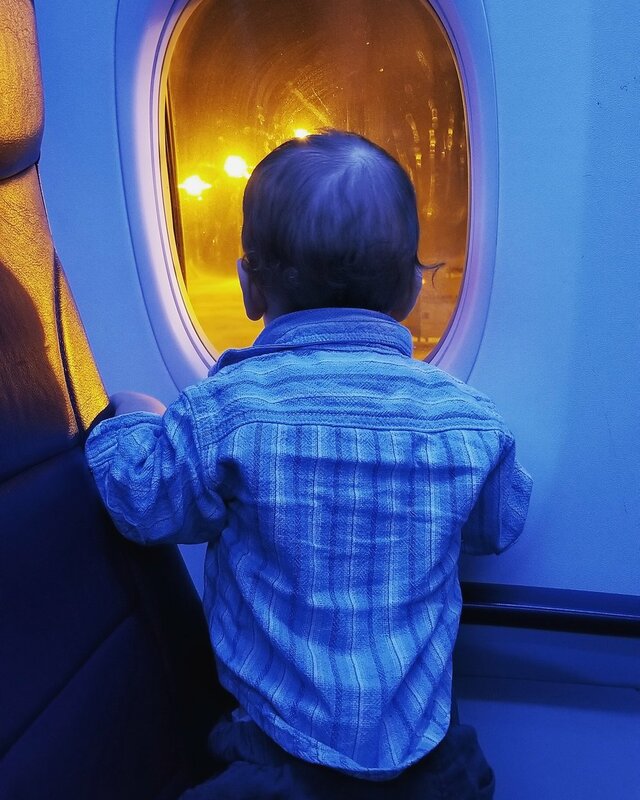 My son Paris (named for the city to which my husband and I traveled very peacefully with our then 8-month-old daughter despite a *7 hour delay* at our *second* connecting flight, through all of which she *did not nap*) is a year old and to be honest, I'm not sure why he was wailing. Right from six weeks old, my girl was a delightful traveler on a plane and in my mind, her good behaviour was to my credit, so for me to be holding my inconsolable child was a humbling experience, to put it mildly. Had you not been kind to me, I may not have been very kind to myself. I'm talking to you, flight attendant who told me your kids were both awful flyers as babies but you traveled the world with them anyway and it was worth it because they are now interested and independent. I’m talking to you, pilot who made an exception to the everyone-remain-seated rule so Paris’ diaper could be changed as the plane was de-iced on the runway. I'm talking to you, guy across the aisle and one row back who noticed Paris was making ticking noises and pointing at your hand as tears rolled down his cheeks. You gave him the watch right off your wrist. I'm talking to you, everyone along the aisle who tried to distract him for a moment as I bobbed on by, asked if his ears were hurting, gave me reassuring words, or simply a smile. I'm talking to you, couple in front of me. Sir, when Paris finally fell asleep, you told me he was cute. To know that you could bring yourself to even *look* at us was relief. 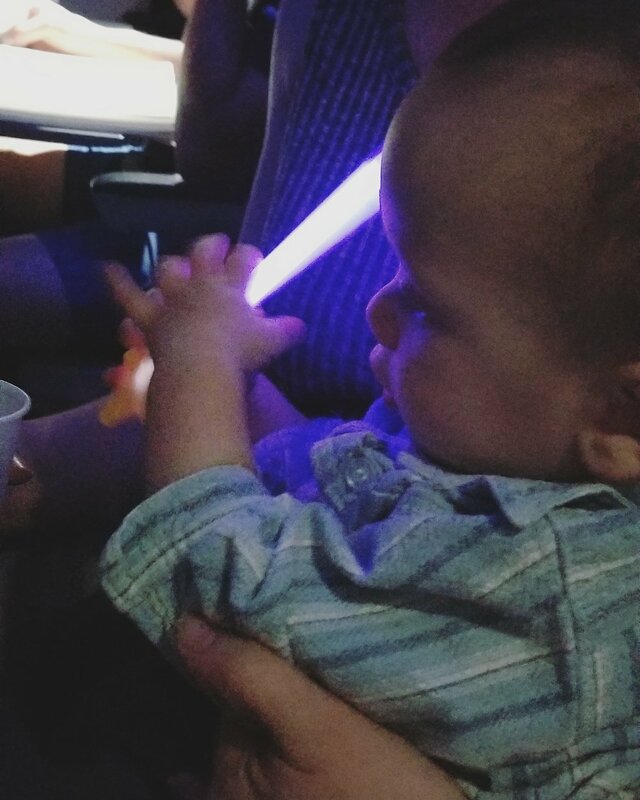 I'm talking to you, mom who gave me a glow-in-the-dark magic wand that really did stop his cries for a while. You told me gently, gesturing to your own children, one quiet and the other asleep, "it doesn't always look like this." I know nobody wants to listen to a baby cry on an airplane (because, ditto) so thank you for your compassion and general lack of icy stares through the whole ordeal. As a stay-at-home mom, the vacation I took with my whole family saw me read my first non-kid book in, I don't even know how long. It gave my kids the time to connect with their aunt and uncle whose schedules are generally pretty full, and it gave me a break from preparing meals, keeping the house tidy, and supervising my adventurous little Paris all day long (because his dad, Grandpa, and Nana were on the trip, too). So once again, thank you, and please wish me luck because I'm taking this guy to Vancouver in a few weeks all by myself. Here's hoping either he's in a better mood or the plane is full of people as understanding as y'all.